A very easy and economic way to clean your fire door without the expense of those chemical can oven cleaners. Cleaning a stove glass on a wood stove is an everyday job in the winter months. After the annual visit from your chimney sweep or your DIY chimney cleaning is over, the hearth is once again ready to give light and heat to your room. 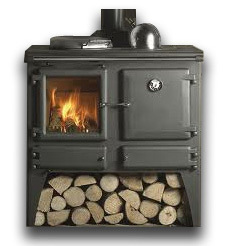 A wood burning stove is a great way to banish the winter months from your home. It will warm, light and create a natural airway through your home. Using a wood burning stove does however require work each time it is used and probably the most frequent job you will do after cleaning the fireplace is cleaning the stove glass. I have tried many products and techniques for stove glass cleaning and some have been disastrous, either by not cleaning the glass at all or worse scratching the stove glass making it harder to clean than before. Take it from me soap and water won’t clean a wood burner stove glass properly. When wood burns in a wood burning stove it leaves a dusty brown residue on the glass. This can largely be wiped off while the fireplace is heating but after the wood stove has been on for a while it cakes on hard and eventually goes black. With this method of stove glass cleaning you can clean your glass fire door for free as often as you like.